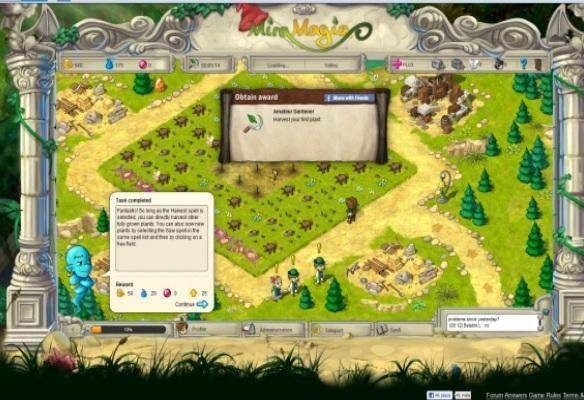 In the Miramagia players take on the role of a Shamen, which, mage or a Druid, where they work hard towards building up their own garden and raising a fearsome dragon to call their own pet and working alongside other players and competing against friends in this colourful, fun and family friendly massively multiplayer online role-playing game that is completely free to play. The game is particularly casual but has a real sense of competition and achievement orientated tasks to create a welcoming community and fun atmosphere for players new and old. With your own farm players must master the arts of growing mystical plants, herbs and shrubs, requiring magic, attention and patients. Grow rare and exotic plants and trade them with other players in game to make a tidy profit at the Village market. Using magic spells such as the ability to change the weather and make it rain to water your garden and get the most from it, create new spells through your own laboratory, decorating it with magical artefacts, and take on Alchemy challenges and solve the daily golden quest. Foster a baby dragon and raise it from a newly hatched egg as your own pet, helping it grow from infancy into full-grown adult dragon companion. Compete with other players in fantastic dragon races using your own dragon or organise a race yourself! Become a pro racer using strategy and tactics and compete for amazing prizes and more importantly for fun! Become an integral part to your own village and work alongside other like-minded players as you make new friends, help each other with your gardens and generally play and have form together. Work as a successful village, performing a village tasks such as tending to the village tree or competing against neighbouring villages, will yield over 500 unique decorations that players can use to decorate the village itself as well as specialised decorative items during special occasions (Valentine’s day, village dances, Halloween and Christmas). Take on quests from visitors to your village, working together with your neighbours, and climb your way up the rankings and be recognised as one of the most famous and successful villages with the most revered gardeners and magicians in the whole of Miramagia.